When ten-year-old Winnie Foster stumbles upon the Tuck family's disturbing secret, she is forced to come to terms with her conflicting emotions. She feels drawn to the loving, gentle and rather eccentric Tucks, but what they tell her is too incredible to be believed. Doomed to—or blessed with—eternal life after drinking from a magic spring, the Tuck family tries to make Winnie understand that the terrible magic of the forest spring can never be revealed. The consequences to the world could prove to be disastrous! But then an unexpected complication arises when Winnie is followed by a stranger who wants to sell the spring water and make a fortune. 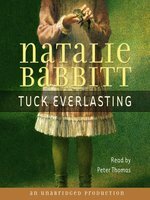 Natalie Babbitt, who started as an illustrator, is the recipient of numerous prestigious awards for the children's books she has written.